This envelope originally contained a letter written to Mayor Carl T. Langford a year before he stepped down as Mayor of Orlando. Mayor Langford was a popular mayor, known for his political irreverence and sense of humor. He presided as mayor from 1967 to 1980, during the city's greatest period of growth following the arrival of Walt Disney World. His most important legacy was the Orlando International Airport. 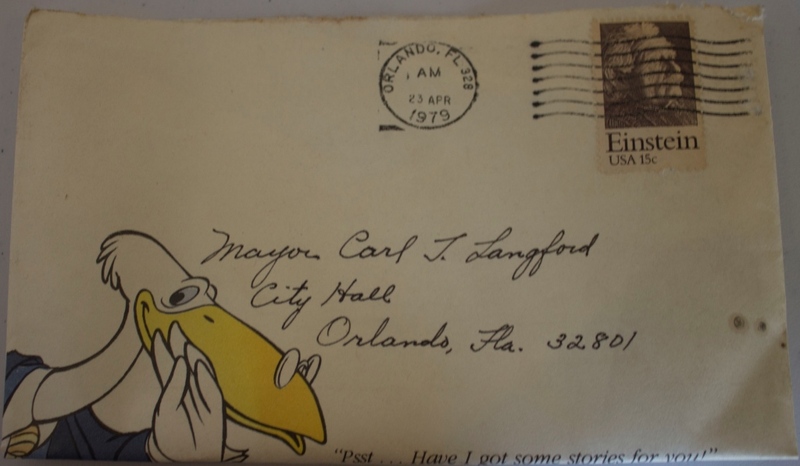 Original envelope to Mayor Carl J. Langford, April 23, 1979: Orlando Remembered Exhibit, Downtown Orlando Post Office, Downtown Orlando, Florida. Digital reproduction of original envelope to Mayor Carl J. Langford, April 23, 1979. Weiner, Jeff. "Carl Langford: Former Orlando mayor led city during period of tremendous growth led Orlando during period of tremendous growth." The Orlando Sentinel, July 9, 2011. http://articles.orlandosentinel.com/2011-07-09/news/os-obit-carl-langford-20110709_1_mayor-buddy-dyer-carl-langford-longest-serving-mayor. 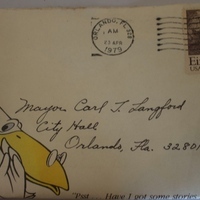 “Envelope to Mayor Carl T. Langford (April 23, 1979).” RICHES of Central Florida accessed April 19, 2019, https://richesmi.cah.ucf.edu/omeka/items/show/5564.